The Old Hat Factory in Quernmore, near Lancaster, Lancashire sleeps 2 people. The Old Hat Factory near Lancaster was a originally a hat factory; the owners have lovingly renovated this delightful detached cottage to provide a relaxing retreat, with superb views from every side of the cottage. 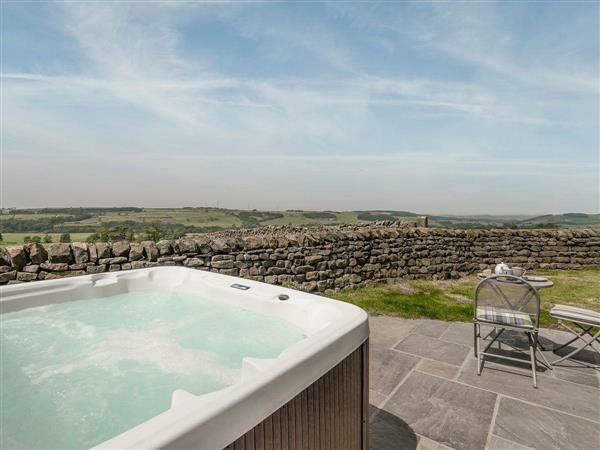 The private hot tub allows you to relax and enjoy the wonderful views, and a chance to rest your muscles from all the walking on offer in the area. This peaceful setting and beautifully appointed cottage, with many additional unique features such as a free standing bath in the bedroom, placed in front of the Juliet balcony, with stunning views overlooking the Quernmore Valley, provides the ideal couple’s retreat. The property is set on a working dairy farm and is a convenient location for discovering the Lake District, Forest of Bowland and the Lancashire coast. There are a number of walks in the immediate vicinity, including Clougha Pike, less than a mile away, and Williamson Park, less than 3 miles away. Ingleton and the Yorkshire Dales are just 18 miles away, and Kendal, gateway to the Lakes, is just 27 miles. The historic town of Lancaster, 4 miles, has a castle, numerous shops, restaurants and bars, and The Old Hat Factory is a great place for parents to stay in whilst visiting their children who may be studying at Lancaster University. Morecambe Bay is just 8 miles away, whilst the many attractions of Blackpool are just 35 miles, including the Pleasure Beach, Blackpool Tower and the Illuminations. The beach is 6½ miles from The Old Hat Factory near Lancaster. With the shop and pub 2½ miles, and the restaurant is 2 miles from The Old Hat Factory. Living area: With multi-fuel burner and 28 Freeview TV. Bedroom: With zip and link super king-size bed (can be twin beds on request), Freeview TV, free standing bath, Juliet balcony and beams. Oil central heating (underfloor on ground floor), electricity, bed linen, towels and Wi-Fi included. Initial fuel for multi-fuel burner included. Welcome pack. Lawned garden with patio, garden furniture and barbecue. Hot tub (private). Private parking for 2 cars. No smoking. Holidays at The Old Hat Factory run from Friday to Friday. For a better idea of where The Old Hat Factory is, you can see The Old Hat Factory on the map below. The Old Hat Factory is in Lancashire; should you be on the lookout for a special offer, you can find all the special offers in Lancashire. It's always worth checking to see what is on offer at the moment. Do you want to holiday near The Old Hat Factory (UKC2026), you can see other cottages within 25 miles of The Old Hat Factory; have a look to find your perfect holiday location.